And I present to you, Progeny, the Wegu Slayer. I know set 5 is just around the corner, but if anyone wants a deck that beats the 90% meta game of Conjuwegu I have found the cure for this disease. The answer is not 3/6 robots with oppressive abilities, it is not 6/6 upgrade board wipers, it is not in the form of free creatures being brought in off of other creatures, no... our hero is in the form of a 2/2 that just never dies. You either die a 2/2 or you live long enough to see yourself become the 6/6. . So first, when you saw that big beautiful Progeny up there I bet you were thinking, oh man... how is he gonna make amazing synergies with Tarsus? Oh boy, oh boy, what other incredible enter the battlefield effects is he going to exploit with Suruzal? Well sorry to disappoint, but those two cards are not in the deck. Suruzal, albeit incredibly fun, requires you playing a bunch of cards that don't go well with a good strategy. Progeny is actually totally fine by itself, it really just doesn't ever die which is all that you want in grow wide. Sticky creatures that will ensure you maintain a board for your lifeblood dryads and WWPs to maintain full effect. If Suruzal wasn't level gated, I could see it making the cut, but being level gated and essentially also being dead weight (honestly... a 4/3 isn't trading with anything) makes the card not powerful enough to warrant playing it. You fall to far behind, and it requires a lot to go right just to be useful. That doesn't sound like a place I want to be, I would rather play cards that are good nearly always when I need them to be. Next is Tarsus, yes holy crap he gives things +2 +2 and blah blah blah. NO . 5/5 isn't big enough to trade well with literally anything in the format right now, and occasionally getting +2+2 on a creature is not nearly as good as any of the other cards in the deck. It is a card that force you to level it, it is situational, and it also requires things to be going right for you. I love this card, but as an objective player looking to win games, I won't be playing it. Now, the next obvious question is why... why does Progeny beat Wegu? Well, the answer is simple. It doesn't die. When it doesn't die, it allows you to play your pump spells, preemptively block lanes, and most importantly, put pressure on. Their deck has a little amount of actual removal, mainly only being Duskmaw + Tendrils. When you have a bunch of sturdy threats on board, they can't deal with all of it. 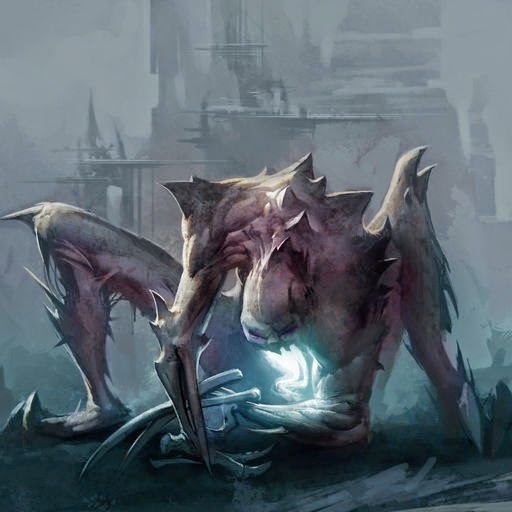 Your pump counters their epidemics and scythes and tendrils, so that line of play is usually a no go; however, I will admit I have won a few games from people choosing to Tendrils my creatures so that they can get even bigger with WWP pumps, but it really does counter their game plans. Aside from Sludge, their creatures are really really bad at doing damage, and with full lanes and pump you can almost always push damage through to keep them below 100 life. The deck just gives their fundamental plans a lot of trouble, and your cards counter their cards. Now, the nice thing about playing Conju Wegu is that sometimes you just get God draws that are unbeatable. I had someone very near dead, and they just dropped 2x level 3 Conjurers plus 2 Tendrils, and I promptly lost the next turn, but I have a very positive record so far against this deck. As for other match ups, well anything that isn't running Duskmaws is very nearly a free win in the form of Thundersaur + Shard, and the only match up that seems really difficult is the Zombie decks, which isn't being played a lot right now because it isn't the greatest against life drain. A lot of the other card selection is pretty obvious, BQ is great and it also grows wide and fits the strategy very well, Hermit and Duskmaw will be format staples till they are nerfed, and then just your typical grow wide cards in the form of Nova, Lifeblood Dryad, and the new addition Progeny. In the deck lists I put a (2) next to Lifeblood Dryad and a (3) next to Soothsayer hermit, these are changes I might make to the deck. That part not in brackets is my current iteration of the list I have been playing with. I wouldn't cut any spells, or change any of them. You need at minimum 6 spells you can play, because when you have a full board you are losing out on a ton of value over writing your own creatures, this is where you want to play the spells to maximize your cards and value. I'll concede that Dysian Siphon can be better then shard some of the time, but the deck already misses allied some of the time, and I personally don't like the idea of adding another Nekrium card with allied on it. Don't force BQs, and just mostly play to the board. Your cards all do a good job under leveled, and I have won games playing 3 hands of under leveled cards in Plvl 2, they all just grow grow grow so you don't really ever fall behind. Use your noggin, and like I said there is really no level priority in this deck, just whatever you think might be good at the time, granted Grove Queen is one of the most powerful cards to level, so sometimes I will find myself playing that even if its unnatural to the board state. Other then that the deck is a lot of fun, and in about 20 or so constructed queues I have went 2-2 once, and the rest have all been 3-1 or better. Sunday night to Monday night I made exactly 20 elite tickets (I was also double queueing draft). If your looking for something new that is a good solid choice and feels a lot more fair, give it a whirl! If you happen to be reading this on battlebranded, be sure to check out all the great content on A1 at A1 Website. If you are reading this on A1's website, be sure to check out all the awesome content over at BattleBranded Website. where I will be soon posting a queue playing this deck, it may already be up at the time of this articles release! I hope you all enjoyed the quick read, and go have fun with Progeny, the Wegu Slayer!